We all know that babies cry and as parents we’ve all had those moments where you just can’t figure out how to help your baby. Figuring out how to calm a crying newborn can be the key to your sanity. They’re hungry – Especially in the first few weeks, the primary reason your baby will cry is because they’re hungry. Whether you are breastfeeding or formula feeding, your baby will want to eat every couple of hours. They need a new diaper – Some babies will let you know when they need a clean diaper and others won’t. My son sometimes gets fussy if he has a dirty diaper, but doesn’t mind a wet one. They’re sleepy – Babies need a lot of sleep and if they are awake for too long of a stretch, they can become overly tired and fussy. At this point it is also usually more difficult to get them to fall asleep, but there a few tricks here. They have gas – If your baby has gas it can make them uncomfortable and fussy. Gas is often blamed when it isn’t the problem though so look for other possible problems too. They have Colic – If your baby seems to be on a schedule of crying for hours at a time, you may be dealing with colic. Just remember the rule of threes for this. 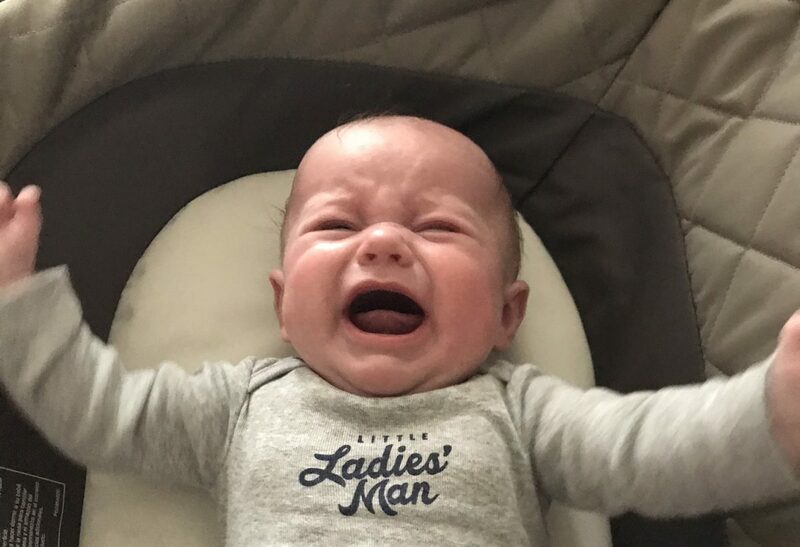 If your baby cries uncontrollably (with no other obvious causes) at least 3 days per week for three weeks or more and at least three hours at a time, this is likely the cause. They’re sick – If your crying baby also has a fever, they are likely dealing with a cold, an ear infection, or some other virus. You’ll want to see your pediatrician if a fever is to blame. Teeth are coming in – Teething can be uncomfortable for your baby and may cause them to become fussy. You can read more about teething here. They want attention – Your baby may simply want to be near you. They spent 9 months all snuggled up, listening to your heartbeat and sometimes they just need that comfort again. Just because – The most frustrating as a parent is when there isn’t any obvious reason for your baby’s crying. When you feel like you’ve tried everything and none of it works, you may find yourself crying right along with them. So what can you do to try to calm your crying baby? There are a lot of options and ultimately the cause of crying will have a lot to do with what works. The best place to start is always to make sure their basic needs are met. If they are crying because they are hungry or need a clean diaper, this is an easy fix. I recommend using an app like Glow Baby to track your baby’s feedings, naps and diaper changes to make it easier to determine if this could be why they are crying. If your baby is yawning or rubbing their eyes along with their crying, they are probably overly tired. When your baby gets to this point it can be difficult to get them to fall asleep. When my son gets to this point, he prefers to be in his crib with his white noise machine, but all babies are different. You can also check out Baby Sleep Miracle for some tricks to help your baby fall asleep and stay asleep longer. Read more about it or watch the video. For some things, medicine may be required to help your baby feel better. If gas is the cause of your baby’s fussiness, you can use some over the counter gas drops to help break up the bubbles. If your baby has a fever, see your pediatrician for treatment solutions. I’m not sure what it is about it, but every time I play The Happy Song, my son instantly calms down. Other fun, baby songs seem to do the trick also. Try out a few things and see what your baby likes because playing a song on your phone when you’re in the car or out in public can be a lifesaver. It is often a temporary fix but can help get you through while you get a better solution going. The MamaRoo has been hit or miss with my son depending on his mood, but a lot of babies love them. The great thing about them is that you can control the settings from your phone so if one option doesn’t work you can try another one without walking over to it. Swings have been a bigger hit for us. 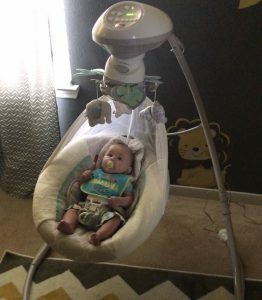 My son loves to watch the mobile on the swing as he rocks and usually calms down pretty quickly. This is another thing where you may want to try a couple different options and see what your baby likes the most. If it’s an option, try going for a walk or a car ride. A lot of babies are happy when they are strapped in nice and snug in their car seat and the movement will often put them to sleep. If you go for a walk, it’s also a great way for you to start getting back to your pre-baby body. Check out more tricks for that here. Warm water can be as soothing for your baby as it is for you. Try giving your baby a bath or hold your baby against your body in the shower. Not all babies are fans of the shower, but for others it may be a great solution for helping to calm them down. Just be careful and make sure your shower has a non-slip surface. If you choose to give your baby a pacifier (and if your baby likes them), this can be a great way to calm your baby when they are crying. Sucking is very soothing for your baby and can help comfort them. If you’re using the pacifier to help your fussy baby fall asleep, the added bonus is that it can also reduce the risk of SIDS. Click here for additional tips on how to help your baby fall asleep. Its easy to get overwhelmed when your baby won’t stop crying and every parent has been there. Remember that sometimes the best way to figure out how you can help your baby is through process of elimination. If you rule out all the usual suspects, nothing seems to be working and you find yourself nearing your breaking point, you may need to take a minute to regroup. It’s ok to lay your crying baby in their crib and leave the room for a couple minutes to get yourself together, or ask your spouse to switch out with you. 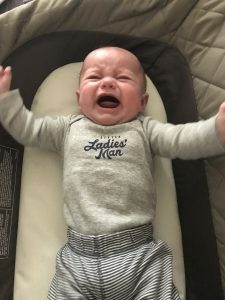 If your baby has colic, you may also want to consider finding someone who can be there to help you out during the time of day that your baby normally cries. Leave a comment and share what tricks work for your baby and continue reading for tips on helping your baby sleep better. I’m about five months pregnant and will be welcoming my baby this summer. I’m very excited! But at the same time worried about whether I’ll know how to help my baby when she cries. It’s so hard to know what they need but this is an excellent set of guidelines to narrow down what’s distressing your baby! I’ll definitely be hanging onto it! I’m so glad you found it helpful. Congrats on the pregnancy! Feel free to check out my other posts as well. I have all sorts of stuff about pregnancy and babies. 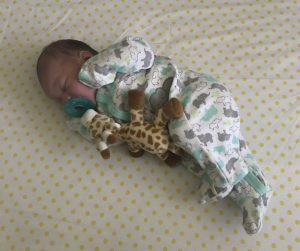 Learning to Swaddle was the best thing I ever learned as a new mother, oh so many years ago. Wrapping that baby up snuggly, like a little burrito, so his arms and legs cannot move, was the only way I kept my sanity. It mimics the inability of the fetus in utero to move in the last stages of pregnancy, and makes the baby feel safe. All of that being able to thrash around, when you’re not used to it, is scary! Swaddle, swaddle, swaddle!! When my son was born and we were in the hospital the nurses did such a great job of swaddling him to keep him snug and happy but my husband and I never really got the hang of it. My son would just break his arms out about 30 seconds after we wrapped him up. We ended up buying swaddle wraps that velcro so we could cheat a little and those worked a lot better for us. I do wish though that I had been able to get the whole swaddle thing down a little better though. Maybe for baby #2. Thanks for comprehensive information, Briana! There are a lot of reasons, why newborn can cry. When my son was that age, he was mostly crying when he wanted attention. I was trying to prevent all the other situations, including hunger, thirst, diaper changing. He also sometimes was crying when he couldn’t sleep, white noise machine usually helped us. But not always, though. White noise machines are great. For my son we had one that was portable and could clip on his car seat (or anywhere else we needed to clip it) and we also have one in his room that we keep on for nap time and bed time.